SIU Carbondale’s history of sustainability starts as early as 1959 with R. Buckminster Fuller, a professor here from 1959-1971, who many credit as being the father of the modern sustainability movement. During his time at SIU, Bucky traveled the world encouraging sustainable values through his philosophies and designs. Today, many people involved in sustainable efforts around the world are aware of Fuller’s work and connect him to SIU. 1999: SIU became the first school in Illinois to sign the Talloires Declaration. 2007: SIU further commits to sustainability! The signing of the Illinois Sustainable University Compact took place, committing SIU Carbondale to nine sustainability goals by 2010, which Plant and Service Operations led the work on accomplishing. Project Eco Dawgs was launched by students and staff to help establish a ‘Green Fee’. RecycleMania begins! Since 2007 SIU has steadily increased recycling on campus with 2013 seeing the biggest increase of the amount recycled since the beginning of the program. 2009: The student enacted Green Fee is unanimously passed! The SIU Board of Trustees unanimously passed the $10 per semester student Green Fee. Chancellor Sam Goldman then appointed the first SIU Sustainability Council to make campus-wide recommendations concerning sustainability and allocate revenue generated by the Green Fee. The Green Fee was overwhelmingly approved by 73% of students who voted in a campus wide referendum. 2012: SIU received national recognition from the Princeton Review for the first time! “The Princeton Review’s Guide to 322 Green Colleges,” praised SIU Carbondale for being committed to sustainability on campus, noting the student led Green Fee as well as ongoing classes and curriculum. 2013: SIU receives the STARS Silver rating. 2015: SIU earns Tree Campus USA designation for the first time! 2016: SIU earns a Bicycle Friendly University Bronze rating for the first time and a second STARS Silver rating. Bicycle Friendly website coming soon! Since 2009 Plant and Service Operations (PSO) has largely led the way in putting the SIU campus on the sustainability track through a myriad of energy efficiency and recycling projects. University Housing and the dining staff have also shown remarkable leadership in sustainability over the years. 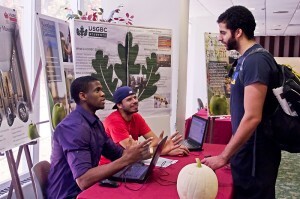 There have been several other department-level sustainability coordination and planning efforts through the Student Center’s Sustainability Committee, Touch of Nature, and the Student Recreation Center’s Green Team. SIU is a member of the Association for the Advancement of Sustainability in Higher Education (AASHE).